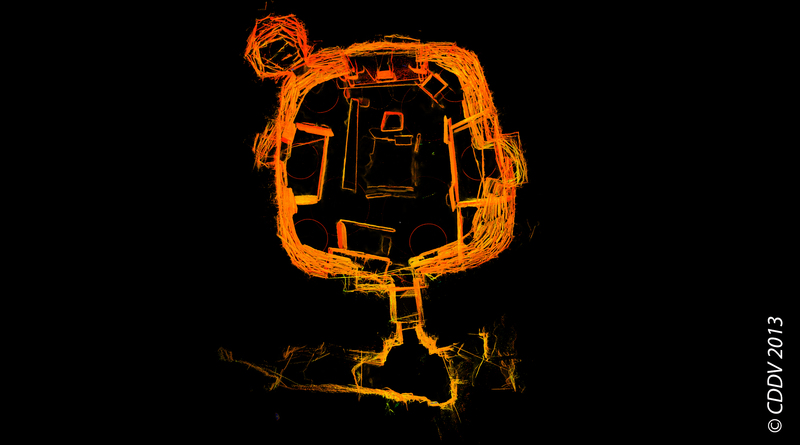 Digital Dwelling at Skara Brae is a collaborative project bringing together three visualisation specialists, each with very diverse methods and mediums of working. The project was initiated following a series of discussions between PhD researchers Alice Watterson and Kieran Baxter together with Dr Aaron Watson, which established a mutual concern for the ways digital methods were shaping archaeologists’ engagement with sites and material culture. While field archaeologists engage with the archaeological record through their senses, these experiences are often mediated through technologies such as cameras, survey machines or scanners. This influences and even constrains the kinds of information that is observed and recorded, effectively distancing the field worker from their material. Through the act of making an experimental film the project explores the potential of layered multimedia as an archaeological field method; capturing and communicating very different qualities of the archaeological record to systematic and objective techniques of data collection alone. As a work in progress, the film moves from the present day to the imagined past; from a remote aerial perspective to an embodied encounter deep within the walls of the village; and from objective interpretation to creative storytelling. 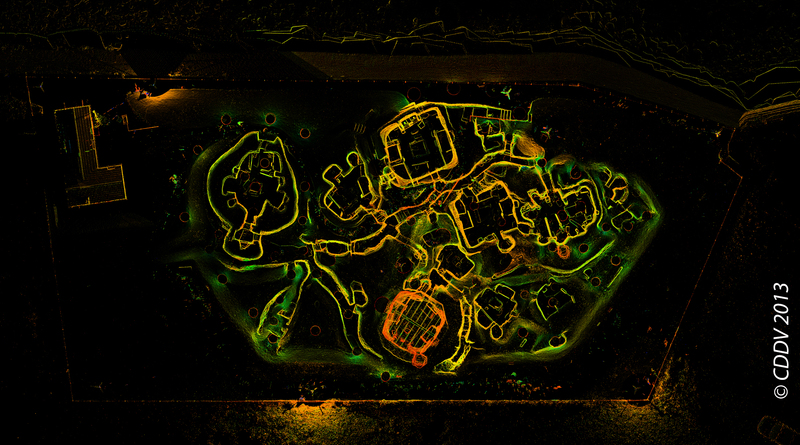 The Neolithic site of Skara Brae, located in Mainland Orkney off the northern coast of Scotland, was surveyed in 2010 by the Scottish Ten project using laser scanners and photogrammetry rigs. 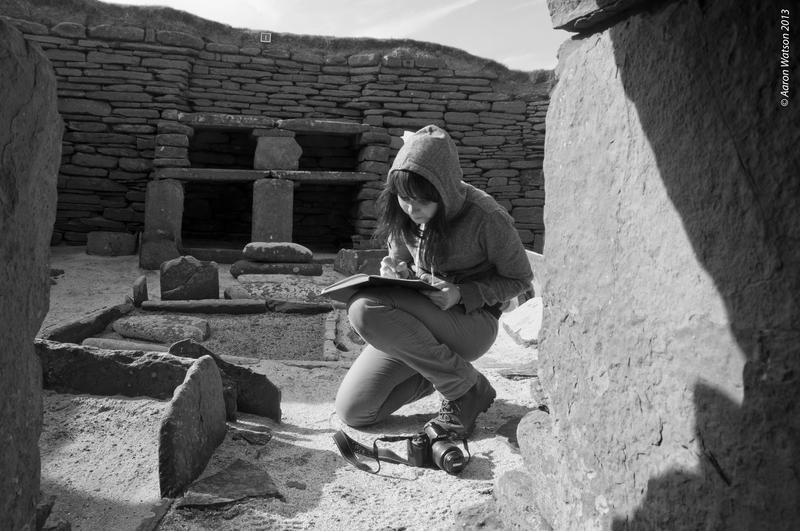 The fieldwork combined site visits to both Skara Brae and contemporary sites within the wider landscape with laser scanning, photogrammetry, kite photography, film, painting and drawing. We made a conscious effort to engage with the site through our creative process with an awareness of acoustics, texture, and the experience of moving through the space. Adoption of a more involved way of recording a site gave us time to linger, observe and interpret. Alice making notes in House 1. Kite aerial photography was incorporated into our observations at Skara Brae in an attempt to summarise the complexity of the site in a single overview. From the oblique angle chosen for this shot, the features within Skara Brae are separated out whilst remaining recognisable, helping the viewer to orientate themselves and establishing the site within its immediate landscape. There is also a dichotomy accompanying this aerial imagery, which is at once familiar and estranged. In contrast to the elevated view from the sea cliffs, this suspended view departs from the experience available to fieldworkers, visitors, or people in the past. 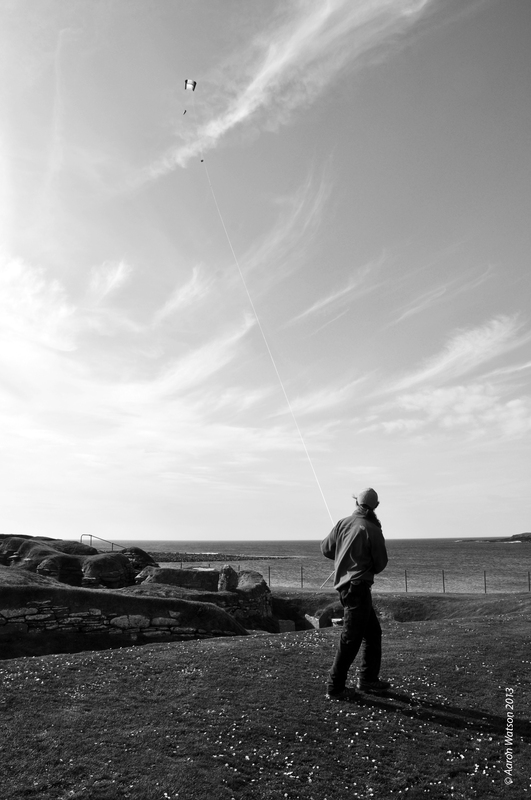 Kite aerial photography at Skara Brae. A view from the kite. 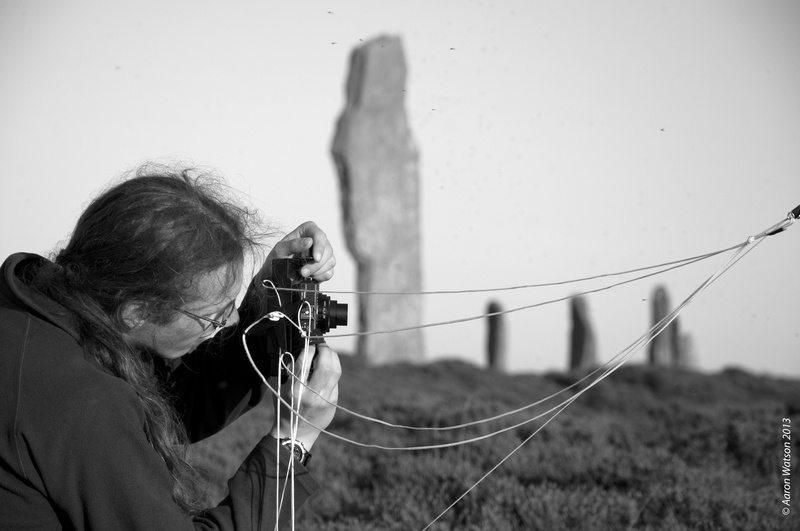 Kieran reviewing his kite photographs at the Ring of Brodgar. 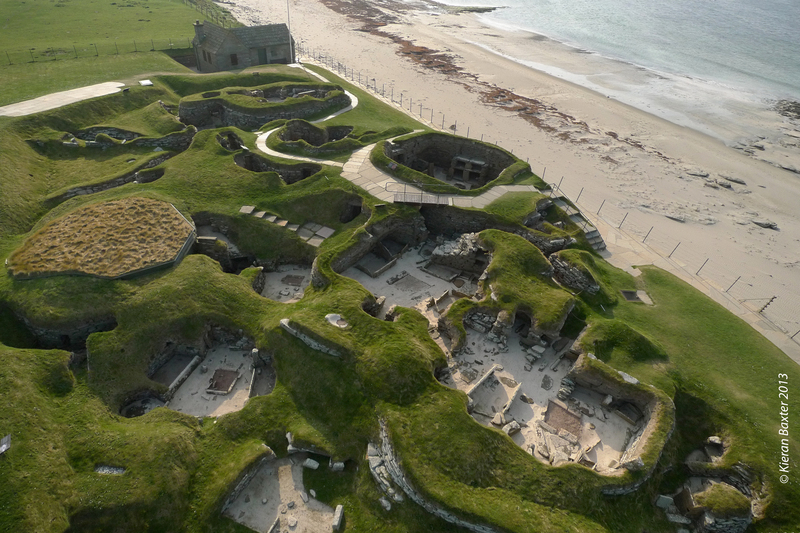 Kite aerial photograph of Skara Brae. 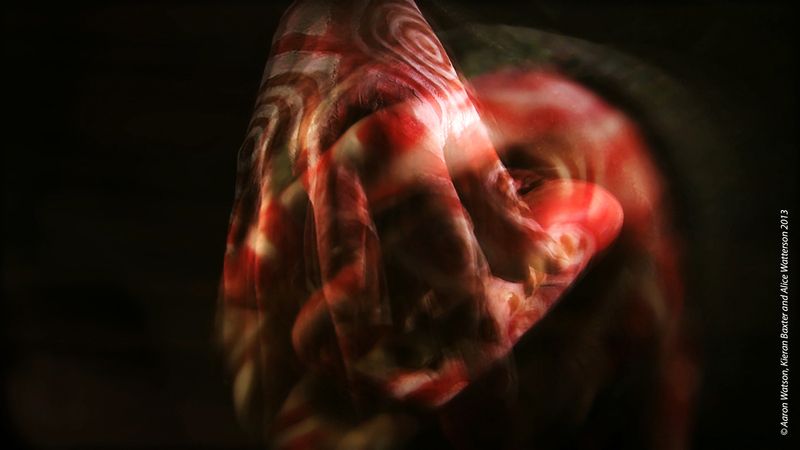 In the film the camera moves down into a passageway then turns to focus upon a stone incised with abstract lines which are lit by flickering red firelight dancing across the surface. 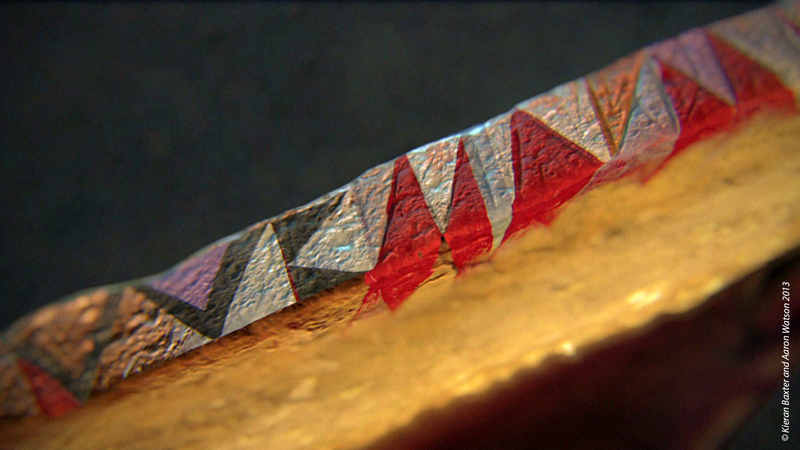 In this sequence, live action footage is mixed with computer generated shots of Neolithic art. Scratch art within the passageways appears at apparent spatial boundary points and has been described as being ‘muted’ and ‘secretive’ (Shepherd 2000), implying that its meaning is more than decorative. Our film acknowledges this incised art as the camera lingers across the stone surface, while abstracted shapes evoke memories or visions. Investigating the scratch art in passage A. The camera turns sharply and enters a low and foreboding passageway. Erratic movement reinforces the sense that we are now looking through the eyes of a protagonist. Hands reach out to guide through the darkness and then the image distorts, suggesting visions or memories evoked within this confined place. Passage B is an uncomfortable and claustrophobic place, requiring the visitor to crawl around a tight corner and down a slope. 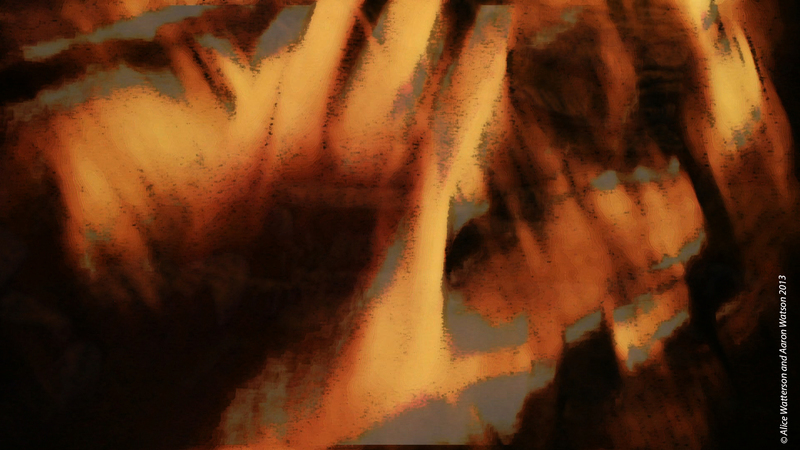 We included shots of our hands to directly capture the difficulties of negotiating this space, reinforcing the impression that the protagonist/audience are now situated firmly within the scene; that this is now an embodied experience. The camera then moves through a narrow entrance, revealing the interior of a dwelling and a figure dimly visible through the smoky atmosphere. The figure is holding a ceremonial artefact – a Neolithic carved stone ball – and during the conclusion of this transformative encounter this is handed to the protagonist. 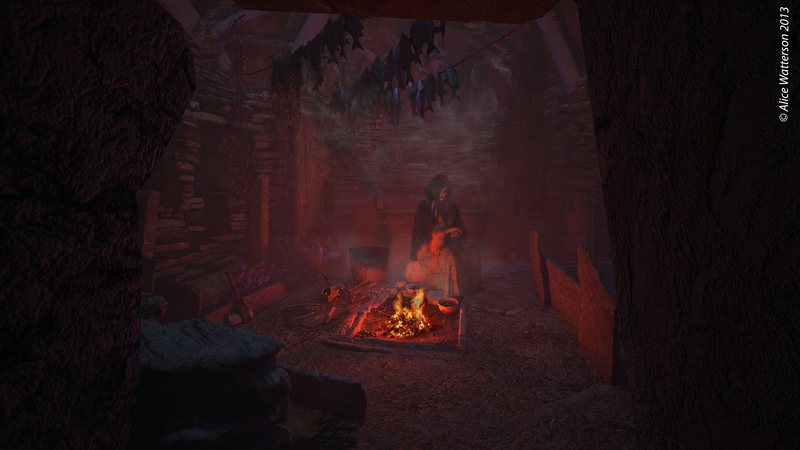 In this scene the interior of House 7 is a computer model created from laser scan mesh and texture data. Reconstructed elements were then digitally modelled, including the speculative architecture of the roof, artefacts, a costumed character, lighting and atmospheres. The shot of the incised art combines sequences of animated photogrammetry captured in the field and draped with a painted image. There is evidence to suggest that House 7 was treated differently to other dwellings in the village. It is spatially separated by the uncomfortable crawl down Passage B and two female burials were placed under the right hand bed when the foundations of the house were laid. It is also the only structure which has a door that can be locked from the outside (Richards 1991). These unusual qualities inspired us to convey this space as a convergence of domestic and ritual. The camera is hesitant, suggesting unfamiliarity or caution on the part of the protagonist, and the unexpected appearance of shifting imagery and colour conveys further ambiguity or strangeness, and is also suggestive of the altered states of consciousness often associated with ritual. Scratch art House 7 interior. With creative work like this it would be easy to create a fiction about the site, but we don’t because we are bound by the archaeological record. We work within the space interpretation can occupy while still responding to the evidence. The narrative arc of the film is driven by a convergence of evidence from the archaeological record and our own sensory engagement as field workers; from the virtual to the actual, and from the sky to the underground. The journey begins with the disembodied perspective of flight, and ends with a direct encounter with an imagined person; from the wider landscape to a single artefact. The film is not a reconstruction as this would suggest that it is possible to see through the eyes of Neolithic people. 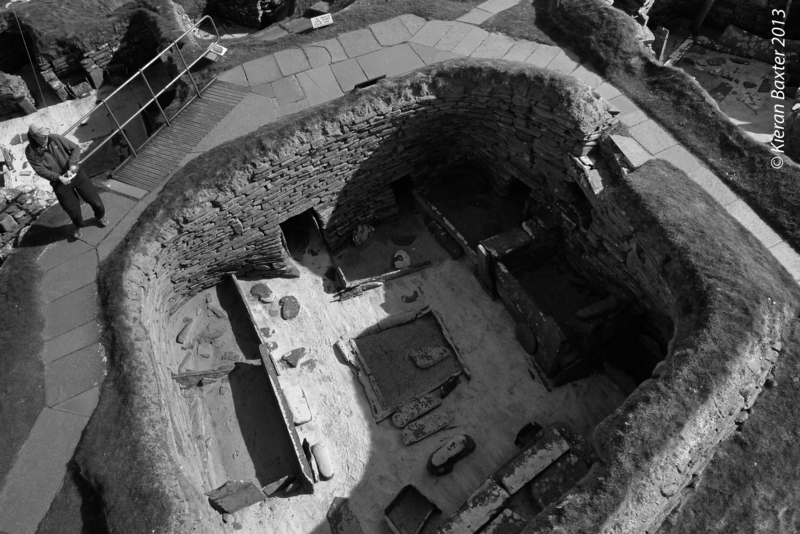 Instead, it is a story about our own engagement with the archaeological record at Skara Brae. It portrays the past as it is experienced in the present; unfamiliar, emotive, dynamic and transforming. 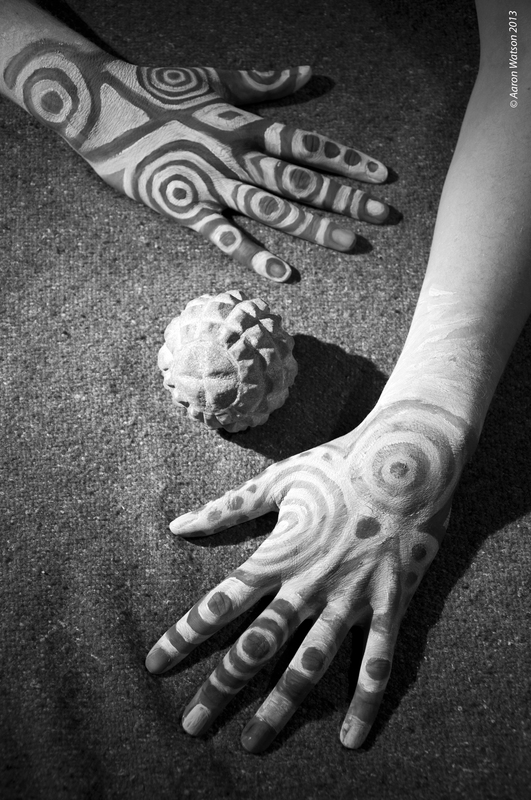 Painted hands and a carved stone ball. Many thanks to Historic Scotland for funding this project and to the Scottish Ten team and CDDV (Centre for Digital Documentation and Visualisation) for provision of data. Thanks to both the Digital Design Studio at the Glasgow School of Art and to the Duncan of Jordanstone College of Art and Design, The University of Dundee. 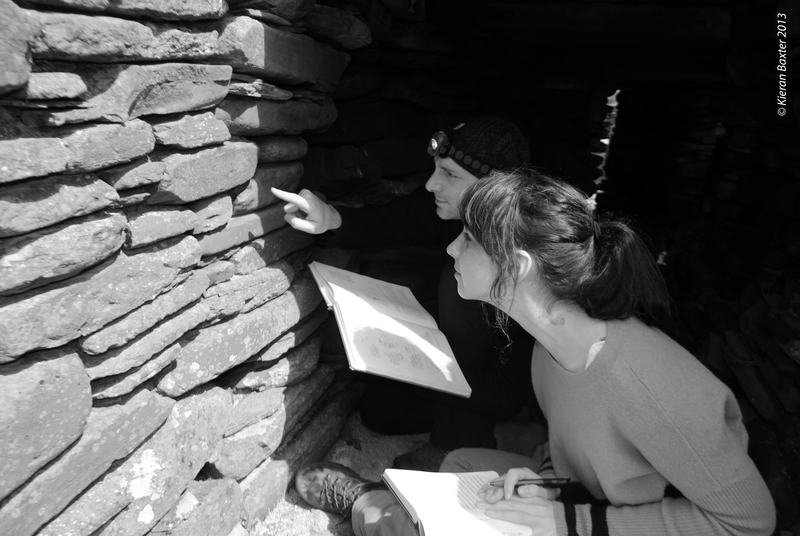 We are especially grateful to Alice Lyall and Stephen Watt for arranging site access, and also to Mary Dunnett, Ann Marwick, Alan Jones and staff at Skara Brae and Maeshowe. Special thanks to Nick Card, Jane Downes, Caroline Wickham-Jones, Antonia Thomas, Peter Needham, Neil Firth and all those who took part in a focus group hosted by Orkney College. Kit Reid and Richard Strachan for their support and feedback. Alastair Rawlinson for his wisdom and assistance back in the lab. Finally, thanks to Jeremy Huggett and Paul Chapman for their advice and guidance. Provocative! Will get everyone thinking the site and interpretation of it. Love that descent from above down into the house. I just did an investigation of lighting in Neolithic houses at Catalhoyuk (Turkey) using Sketchup and physical models for an undergrad course. I love the intersection of design/architecture and archaeology. Looking forward to seeing more similar work from you…you never know where film and archaeology will take you…consultant on Game of Thrones ha ha , why not? Hahaha, that would be amazing!….I’d only accept the job if they paid me with a direwolf puppy. Hi Katy, That’s great! You should be able to download it right off vimeo (https://vimeo.com/66396373) if you need to access the video offline.